Gunshot Road almost seems secondary to the sweeping and atmospheric descriptions of the Australian outback and its indigenous people. The unique characters, and most especially Emily Tempest, are sharply defined, colorfully drawn and readily appealing." 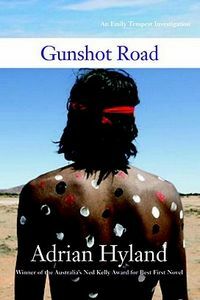 > Gunshot Road by Adrian Hyland, a Mysterious Review. Review: When Emily Tempest is offered the position of Aboriginal Community Police Officer — a cop with limited powers — she agrees, but mostly because the job comes with a 4-wheel-drive that is government fueled and maintained. She's barely donned her new uniform before being called upon to investigate a brawl that ended in murder in Gunshot Road, the second mystery in this series by Adrian Hyland. Dead is prospector and geologist Albert Ozolins, a hammer to the throat. He had had a very public argument with a local, John "Wireless" Petherbridge, the previous night and while Wireless admits to getting physical — they were arguing, of all things, over one of the ancient Greek philosopher Xeno's famous conundrums — he doesn't remember hurting his old friend, let alone killing him. Of course the vast amount of alcohol both men consumed isn't working in Wireless's favor, as he has no recollection of what exactly happened afterwards. Though Emily is familiar with the area and its residents, her new boss wants her to keep the peace elsewhere. Still, she doesn't want to see Wireless railroaded into being convicted of a crime he didn't commit, and pursues her own investigation. The mystery in Gunshot Road almost seems secondary to the sweeping and atmospheric descriptions of the Australian outback and its indigenous people. The unique characters, and most especially Emily Tempest, are sharply defined, colorfully drawn and readily appealing. It's easy to be drawn into the exotic world that defines Emily's very being and forget, at least temporarily, that there's a murder investigation going on and a killer to be identified. The first book in the series, Moonlight Downs won the 2007 Ned Kelly Award for Best First Novel. In many ways, however, Gunshot Road may even be better. The storyline is more tightly plotted, the writing more assured. But this perception is most likely due to the confidence Emily displays as she moves from an amateur sleuth into a more professional, authoritative role. This is definitely a series worth watching. Acknowledgment: Soho Press provided an ARC of Gunshot Road for this review.